We have partnered with Riteway Charity Services to help you receive the maximum benefit possible for your vehicle donation. Call today to schedule a pick up and help the mission drive away hunger and homelessness! Call Riteway at (888) 250-4490 to schedule a pickup for your vehicle. Cars, boats, RVs, travel trailers, and fleet vehicles in working condition. 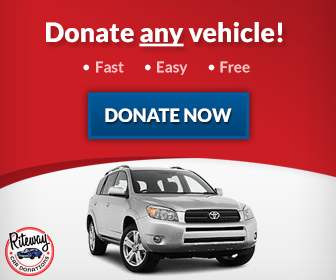 If you have any questions about what you can donate, please call Riteway at (888) 250-4490 for more information. Provide us with the title, registration, and keys to the vehicle. If you do not have title papers call us anyway; other arrangements can be made in most instances. You can contact Riteway at (888) 250-4490. At the scheduled time, we will arrange the proper vehicle to tow your car, boat, truck, RV or travel trailer. As soon as you contact us, we can normally pick up your car within a few days. If you need your car picked up sooner, we can make those arrangements. We can refer you to IRS Publication, which sets forth the manner in which the IRS requires you to determine the value of your donated property. You can review this publication on the IRS web site. If your donation is worth more than $5,000, you will need an appraisal for tax purposes. How do I find what is my car worth? Visit Kelley Blue Book or NADA Guides to get a general idea of what your car may be worth. Please bear in mind that this is only used as a general guideline and does not indicate the kind of tax deduction you will receive. The mission is a 501 (c)  all donations are tax deductible as allowed by law and the individual will receive a receipt. Where can I read about IRS information?